It depends. You're talking about the right to lose as much money as you want on a stock, right? Westport Innovations and Fuel Systems Solutions announced a merger on Tuesday. You can see how excited investors are about that in the above chart. WPRT Price data by YCharts. Take two cash-burning, money-losing companies. Mash them together, and what do you get? If the two companies in question are New York City-based "alternative fuel" engine-components maker Fuel Systems Solutions (NASDAQ: FSYS) and its doppleganger, Canadian alt-fuel engine maker Westport Innovations (NASDAQ: WPRT), investors seem to think it makes for a great thundering success story. The problem is, these investors are wrong. On Tuesday, Sept. 1, Westport and Fuel Systems announced plans to merge their two companies, combine their "complementary technologies," and come out the other end with "a premier alternative fuel vehicle and engine company" that will "possess scale and positioning to compete effectively, grow, and deliver strong shareholder returns" in the years to come. Unfortunately, neither Fuel Systems nor Westport has done a particularly good job of doing these things in the past. For example, take last quarter (please). Fuel Systems reported a 23% decline in sales, while Westport's even slimmer revenue stream shrank by 25%. According to data from S&P Capital IQ, the past 12 months have seen trailing sales at Fuel Systems sink 16% year over year; Westport was down 38%. Neither company seems capable of earning a profit, either. Fuel Systems lost $25 million during the past 12 months, and Westport, $128 million. In fact, it has been more than three years since Fuel Systems last reported a full-year profit -- a whopping $5.2 million, earned in 2011. Westport has never earned a profit -- not once -- in the entire 20 years that Capital IQ has been collecting data on the company. When you look at numbers like these, it's hard to avoid making comparisons to Eddie Lampert's quixotic quest to turn Sears Holdings into a success story by mashing up second-rate retailers Kmart and Sears, and trying to go head-to-head against Wal-Mart. It was a quest doomed to fail -- and it did. But is that comparison fair? Against my better judgment, I'm going to give Westport and Fuel Systems the benefit of the doubt today, not dismiss their merger as an exercise in futility, and take a hard look at the numbers to see if there's any chance of this merger working out for shareholders. Here goes. 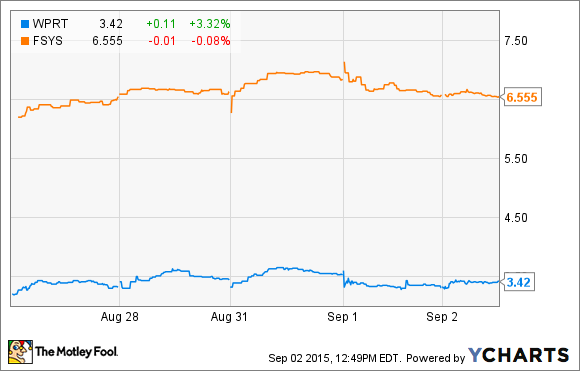 Westport and Fuel Systems: Buy the numbers? According to management, a merged Westport and Fuel Systems -- to be known as Westport Fuel Systems -- will cost $30 million less to run in "savings and merger synergies," pre-tax. Management says it will take until 2018 to fully realize these synergies, of course. But for simplicity's sake, let's assume the savings will be in place on Day 1. In that case, Westport Fuel Systems should collect $380 million to $405 million in revenue this year. That's anywhere from a 14% to a 19% reduction in sales from the $470 million the companies produced individually in 2014 -- and a significant improvement over each company's individual sales performance last quarter, I might add. Westport Fuel Systems will generate these revenues from sales of 17 brands of automotive and industrial products in 70 countries around the globe. Between Westport's emphasis on "heavy-duty and high horsepower" natural gas engines, and Fuel Systems' focus on "light- and medium-duty products," the combined company should cover the gamut of alt-fuel engines used for most purposes. Cash and short-term investments of the two companies amounted to $117 million at last report. That number's likely to shrink, however, as both companies are currently burning cash. Minus Westport's $52 million in long-term debt -- Fuel Systems is debt-free -- and a further $52 million in cash burn -- calculated from both companies' current free cash flow run rate -- I'd say Westport Fuel Systems is likely to be running on fumes by year end, with net cash levels of roughly $13 million. Finally, turning to GAAP profits, the two companies are combining to lose about $153 million annually at current run rates. Subtract $30 million from those losses for the promised "synergies," and even if those savings emerged today -- remember, management doesn't expect to see the full benefit of those savings before 2018 -- Westport Fuel Systems should be a $120 million-a-year money loser when all is said and done. And so we come to the moral of this story: Two wrongs don't make a right. And two money losers, even if everything goes just exactly according to plan, still aren't going to earn you a profit. Long story short, I'm much more inclined to be short these stocks than long.